On Tuesday June 26th the UN office of drugs and crime (UNODC) will celebrate annual World Anti-Drugs Day. Transform Drug Policy Foundation, the UK's leading independent centre of expertise on drug policy and law reform, condemn the UNODC for once again attempting to dress up the striking failure of its anti-drugs strategy as success, and failing to speak out against mass executions of drug offenders in China. “In 1998 the UN drug agencies pledged to create a ‘Drug Free World’ within ten years. However, The UNODC’s own annual world drug reports have chronicled the continued global rise in the production and use of drugs over the last decade, particularly of the most dangerous drugs, heroin and cocaine. By any measure the UNODC's policy and ten year strategy has been an abject failure, with Afghanistan opium production breaking new records, and cocaine use in Europe rising dramatically. “But instead of reflecting on these failures and considering alternative strategies for controlling drug markets that do not involve wasting billions on futile eradication programmes and increasing militarization of the war on drugs, we just hear more tough talking and yet more announcements of new initiatives. “This year, as they launch another initiative with the motto ‘do drugs control your life’, they should be asked why they have continually failed to condemn the practice in China of celebrating world anti-drugs day with mass executions of drug offenders. The UN Special Rapporteur on Summary or Arbitrary Executions has called on China to end the use of the death penalty for drug trafficking, yet the UNODC, who organise world anti-drugs day has never seen fit to comment on China’s barbaric practices. 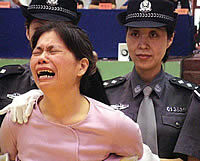 China who was immediately executed on drugs charges. Great. I like what you wrote. More people ought to be more aware! hhmmm, is too far , and too intrusive personal affairs of others countries. Why UN said that the bamboo countries as Barbar, its only a 1/1000 litle litle ratio of their total amount citizen. and they who executed is a drug dealer. And everybody know that drug dealer violation is very cruel more than the assasin. assasin only kill a little people, but drug dealer could kill hundred - thousand amount of people soul. I think. Kill a drugd ealer isn't barbarnian act. Just for reflexion,Why UN dont handle the fail of drugs war at latin america,?? And the funny is why US with so clearly, expalin their strategic plan to public that the strategic is, doing all way so the cost of drugs production and marketing will increase, and until more than some percentage, based on analysis , make the price of the drug, arrived at US, is to high, so the marketplace will move. And US youth generation safe from the drugs devil. But my question? What the next lucky countries that will became target market of latin america? its only deflection. A country who deliberately moving a problem / disaster, so the other neighbors countries we know will receive it. And we realize that the economic condition of our neighbour is far below us. I think if we have the strategic plan and goal like this way, its soound like heinous act and I think this act & mind called barbarnian.